The hubby and I were on our way back home from Saturday morning errands last weekend. I saw a sign in my neighborhood that perked up my ears, Garage Sale. So I grabbed my neighbor bestie in crime and Sharon, Divot and I were off. 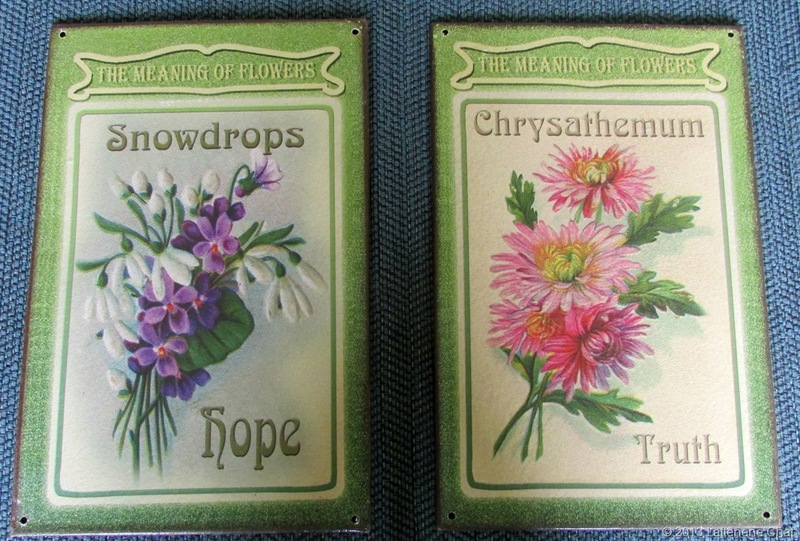 The woman’s Grandma had recently passed away at 94 and she was a collector for years. 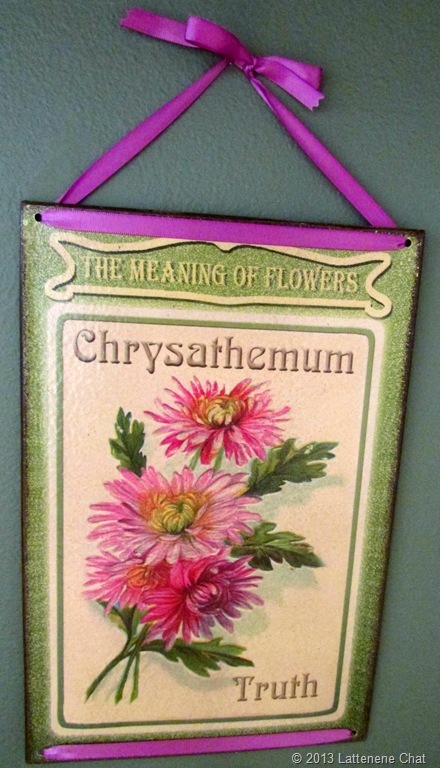 I’m not a big antique person but I do like some things sprinkled through my house. 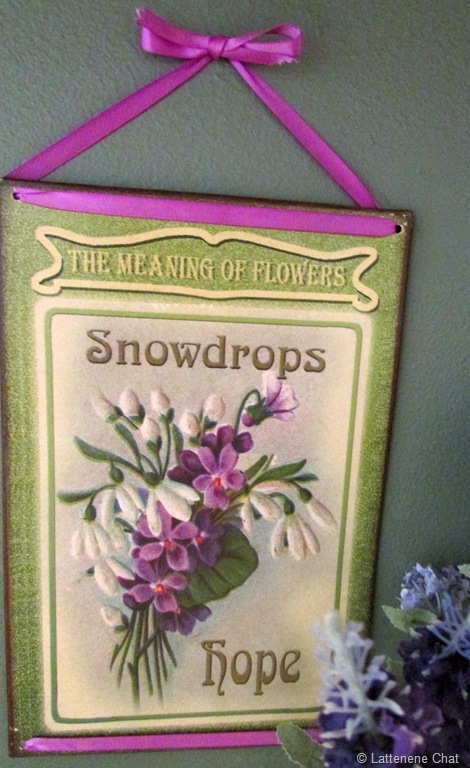 I have this mantra that says something old, something memorable and something green should be in every room. Someday I should write about that. I saw a few things I liked but controlled myself because my husbands birthday, Fathers Day, vacation and our 32 year wedding anniversary are all coming up in the next month. Darn if Sharon didn’t text me on Sunday, “ at the garage sale, everything half price”. Geez, thanks so much. Well, of course I had to go. I bought several items at a great price worthy of another post. I was also looking at a picture I had seen and admired. The woman just told me to take it, Free, because I loved it! I can’t pin point the reason why I like this picture so much. I don’t think it’s worth anything. Maybe I like it because I grew up on 5 acres and used to feed and ride the dozen horses in the pasture next to us. Maybe it’s deep in my soul stemming from my heritage. My dad homesteaded in Montana when he was a boy. My mom’s dad was a farmer in Scotland. Maybe I watch too much Hallmark channel. Whatever it is, looking at it gives me a calm feeling and I love it. 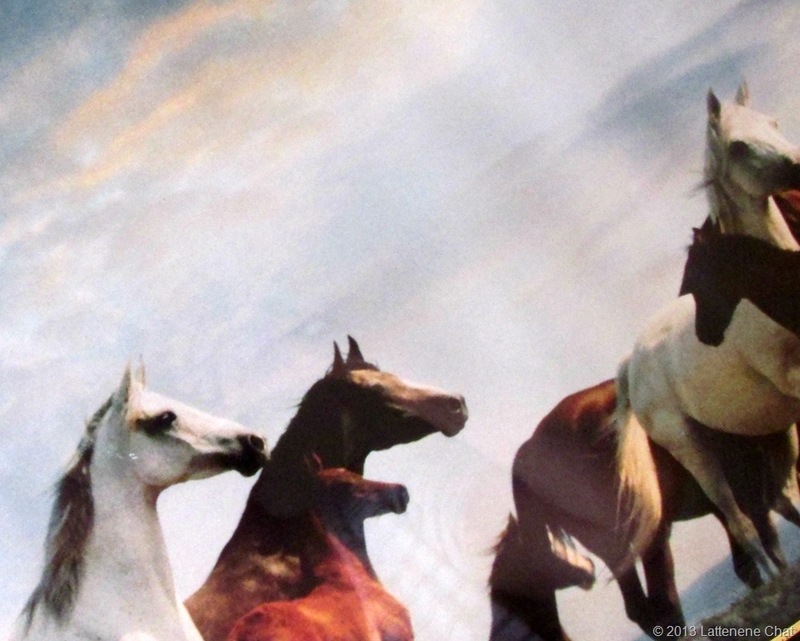 I hung it in my family room so I would see it everyday. Have you ever been in a store shopping or at a garage sale or flea market and something literally calls your name and you just get that feeling? I’ve never really shared pics of my den before. Maybe a Christmas photo here and there. I painted it about 4 years ago, long before this blog was started. 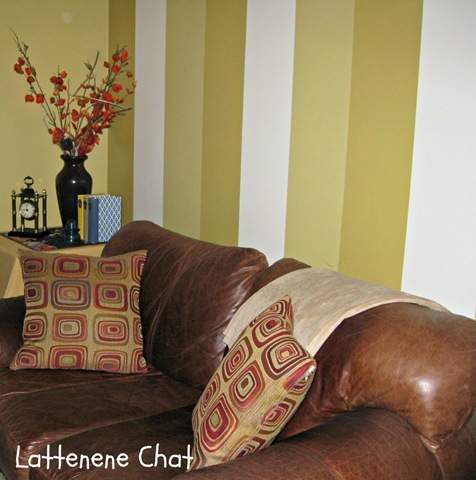 I painted 3 of the walls a gold color and one wall with stripes of the main gold color, a shade lighter and a cream. I remember going to Home Depot for one color and while there I was looking at a paint sample pic that had a striped pillow in these colors and it was all over with. It was a change in plans. It’s funny how I remember this so clearly. It was the first room I had painted in this house. My sis-in-law came up. We started at 1:00 in the afternoon and finished 12 hours later. 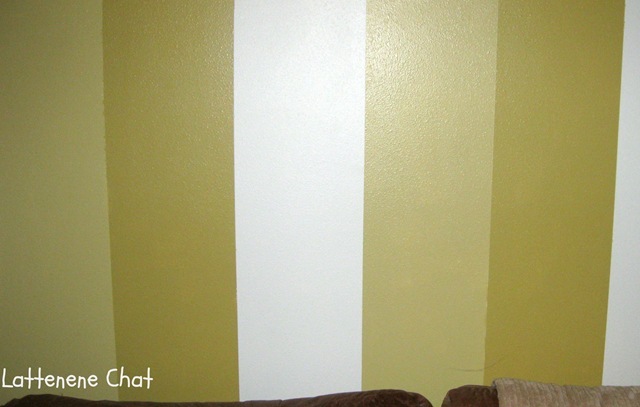 The striped wall took a while since we sealed each stripe so it wouldn’t bleed. 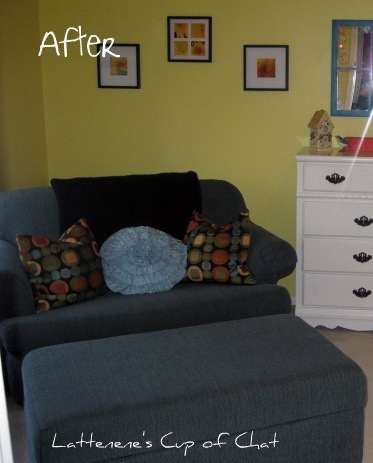 Have you sealed an area before when painting? My hubby has an aversion to putting hole in walls, especially when there nicely painted. It took me until last weekend to find the perfect pics for this wall. And I try to hang pictures when the hubs is gone. So what do ya think? 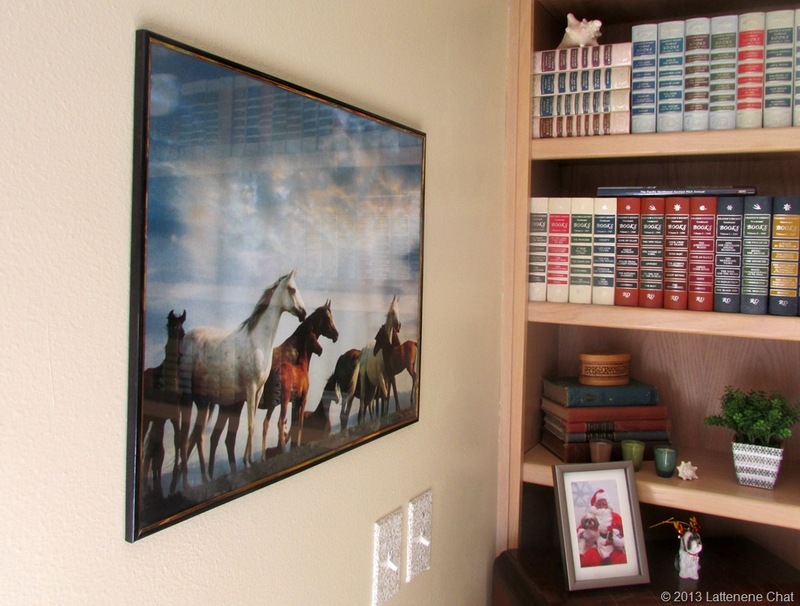 I bought the pictures at Tuesday Morning several years and they’ve been hanging in my bedroom above the bed. That is, until I changed the entire color scheme in there and in my master bath. I call this The Domino Effect and it’s been happening all over my house so I have plenty of posts lined up! Do you play the Domino Effect in your home? 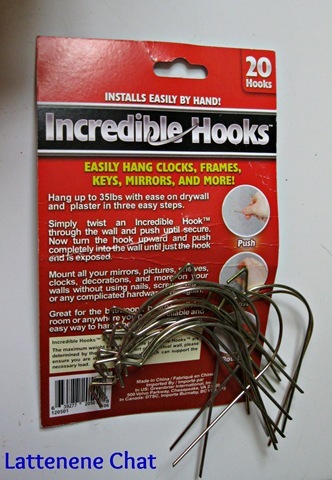 I used the Incredible Hooks to hang theses. Simple and quick, read it about it here. 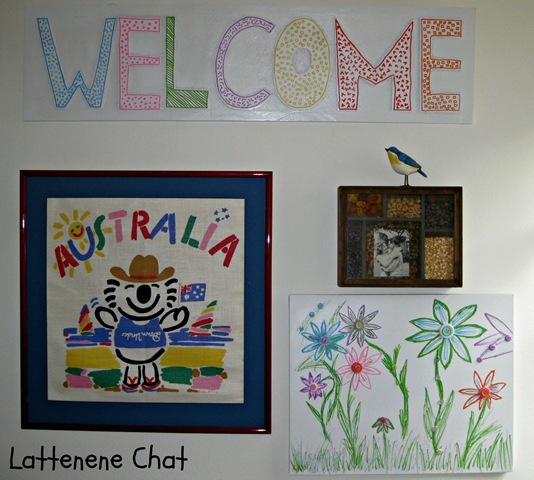 ** I’ve changed my blog name to Lattenene Chat. 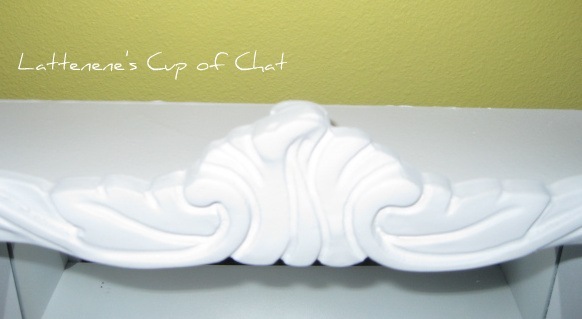 If you do an internet search you will still find posts from it’s previous name, Lattenenes Cup of Chat. Happy Monday. Another beautiful sunny weekend in the Northwest. I stayed pretty busy meeting friends, a little house and yard work, feeding the obsessions with a little shopping. My brother and I also hung my living and dining room drapes yesterday. That is worthy of another post and I’ll share this week. We’ve been busy painting since August; laundry room, the living and dining room, and our bedroom and master bath (yes, will also being sharing these adventures soon). It’s amazing what fresh paint will do, especially when you change the color, take down the curtains and let the sunshine in. My husband has never been a big fan for putting a bunch of pictures up. He calls it “just putting holes in the wall”. It kills him to grab the hammer, especially when there’s a mistake, can’t find a stud or the picture just falls off the wall. It’s never bothered me so I usually will leave the clean walls up for a bit, then hang pictures when he’s not home. This really saves on emotions barfing all over the place. Bad term, sorry, but it’s the only way to explain it. Well, I’ve found the cure! Have you heard of the Incredible Hook? I found mine at Target, but I’ve seen them at Home Depot and other stores as well. And sometimes the name is different, but they all look alike. Its a wired curved hook you feed into the wall and you don’t need a stud. The hanger will hold up to 35 pounds. And it is AWESOME! Here’s a little tutorial for you because we all know a picture(s) says a thousand words. A picture or art wall in a minute. 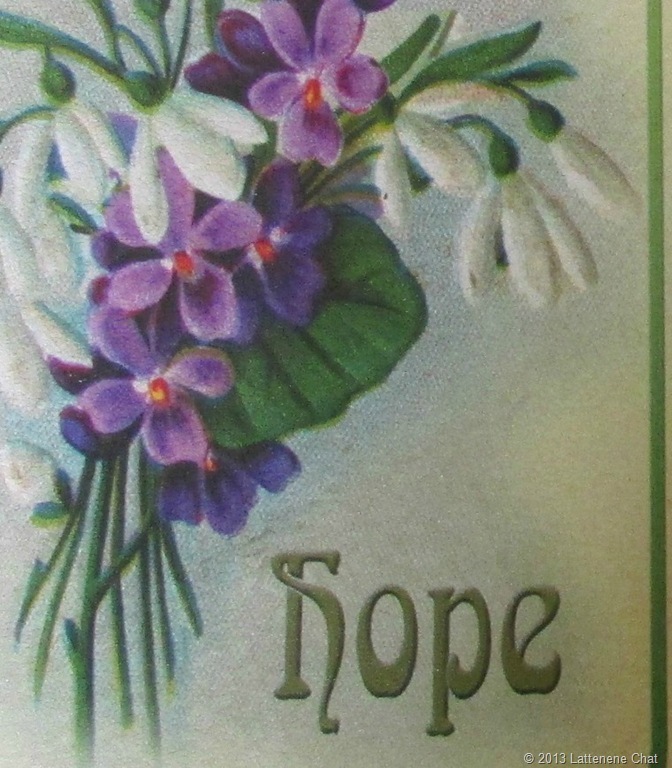 This one is in my laundry room. Did you already know about the Incredible Hook? Have you used it before. Come on, tell the truth, how many holes are really in your walls! Woot Woot! Day 18 and let me just say this challenge has really made my brain stay on overdrive and me into gear. 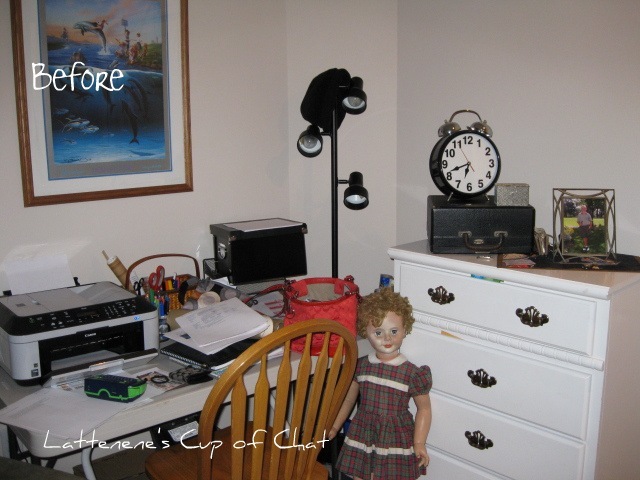 By sharing with you I am motivating myself to really clean, straighten, organize and de-clutter and all before the holiday season. Excellent! I’ve mentioned before that realistically we will always have some clutter. 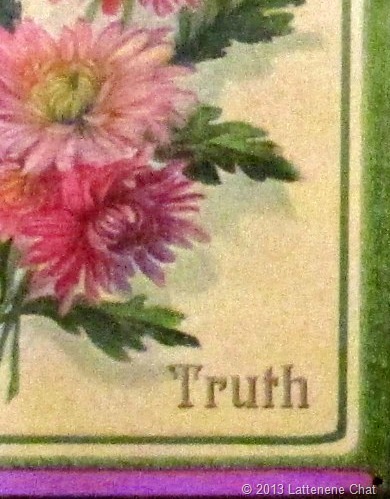 Rephrase: I am real enough with myself to know I will always have a little bit of clutter. 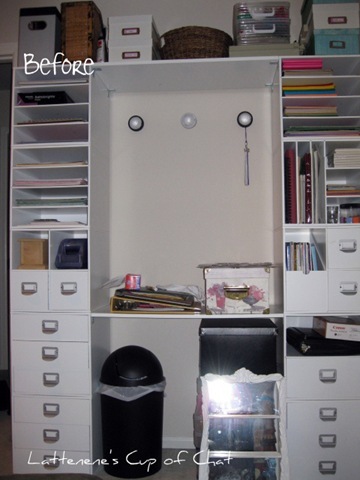 That said, it can be organized and stored effectively so not to make my hubby to crazy. I walked through my house thinking about this yesterday and took a couple of pics of what I use to do this. Apologies, the pics aren’t the greatest. I was using my phone and the lighting was poor. I’ve somehow locked my camera up and need to fix it. I will always have some magazines and we will always lay around in the family room. That’s what it’s for. 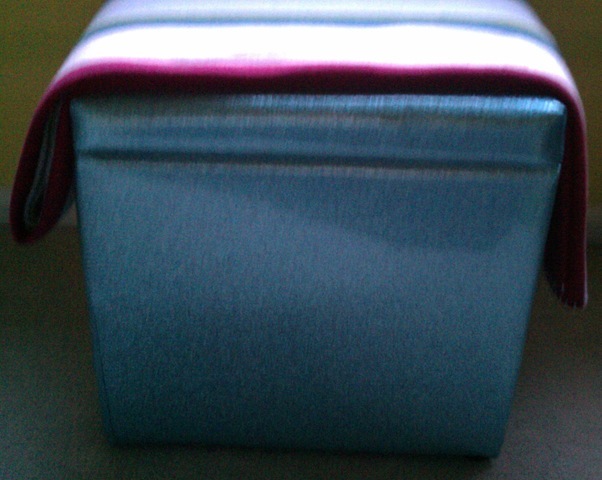 I have two metal cubes that act as my coffee table and I hide blankets, pillows and magazines in them. 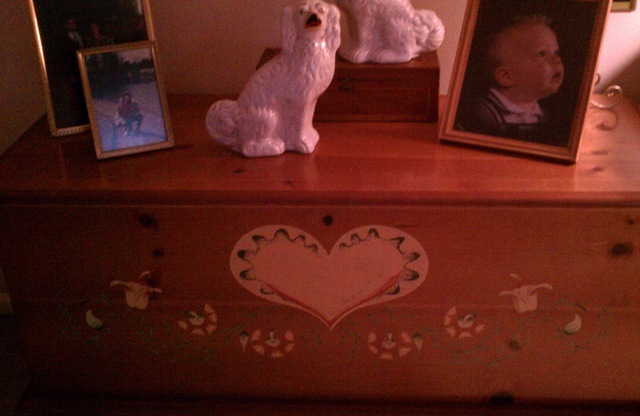 When my mom passed away I brought her hope chest home and it’s full of memories, hers and mine. I know right where everything is and I can go “visit” anytime. 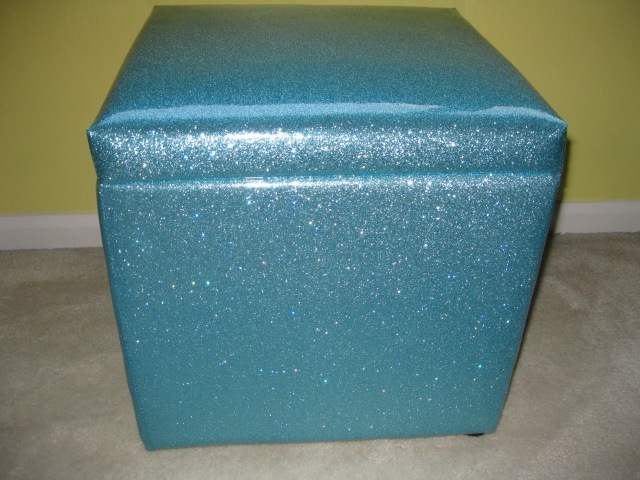 Spare room /guest room/ craft room – this cute turquoise cube has sheets and blankets for the hide-a-bed. 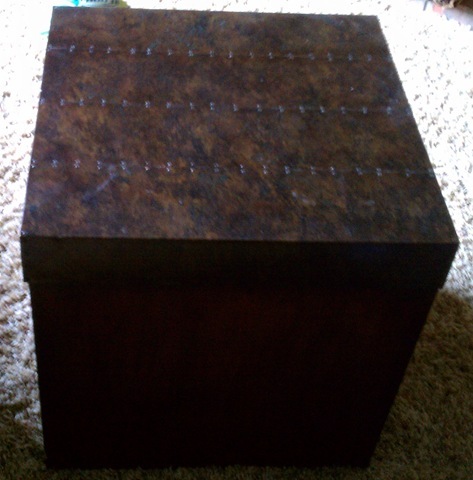 I’ve stacked these large decorative boxes and they act as a side table in my loft. What you can’t see is the backside where I’ve labeled them. There’s one for me, and one for each of my brothers. When my parents and Aunt passed away I became the recipient of all the photos. If I’m watching TV in the loft I’ll sort through photos at the same time and put them in the appropriate box. Doing it this way seems to be working. There ya have it. 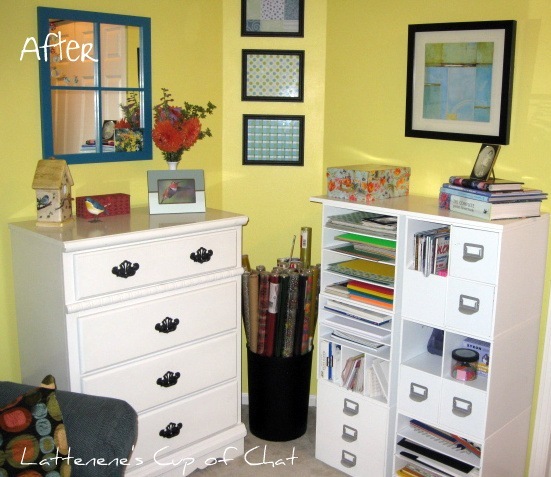 How do you store the clutter that you just can’t seem to get rid of? 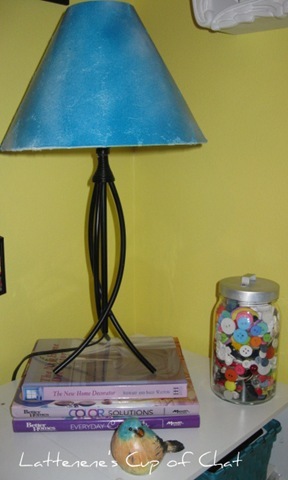 Spare Room Project – Finally Complete! Hi all! 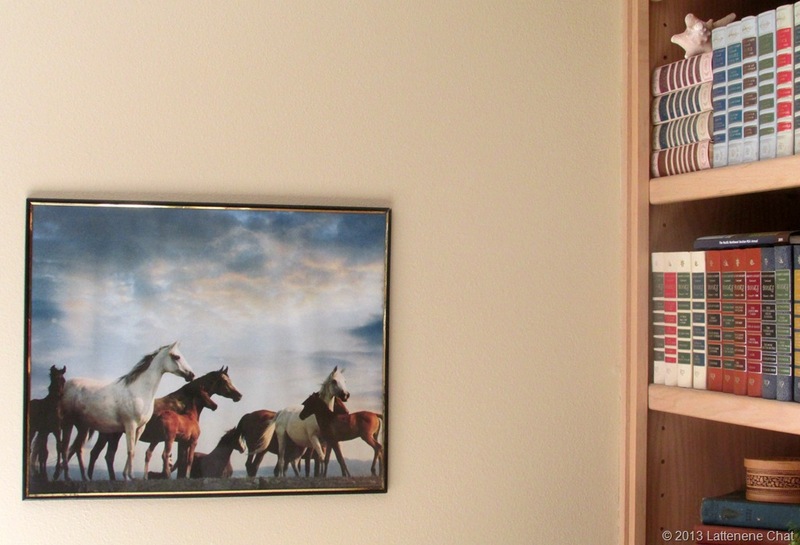 I’m so excited to share that the spare room project, aka craft/guest/reading /my room is finally complete. Well, complete for now. There’s still a few things I’d like to do, but they can wait. When I began this project in early September I gave myself some guiding rules. For full post, (read here). See below how I did. I moved a love seat/sofa bed and ottoman into the room from our loft. 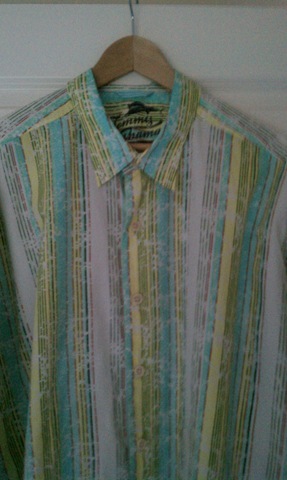 Since it’s a deep blue/green color that helped me decide my colors which came from my hubby’s Tommy Bahama shirt. Okay, without further ado, ta ta da da!!!!! Here are some side by side before and after pictures. Paint by Behr. It’s the first time I’ve used paint with primer built in and I liked it. I love the bright yellow and I definitely moved away form the green zone I was in. Pillows and black throw blanket from TJ Max. Black and white magazine holder from Michaels that I bought six months ago. Oh, and check complete on the location because as you can see Divot can still look out the window! This corner of the room is my favorite area and really says me. My goal was to make it personal and I think I did. The storage cubes were from Michaels bought several years ago. I had a dozen of them and I took them apart (see before picture above) and created two separate areas for them. I had an old bulletin board and when I couldn’t sleep Saturday night I created this look, which I’ll share in a post later this week. Everything on this back wall I either already had, it was given to me or I used my computer to print. 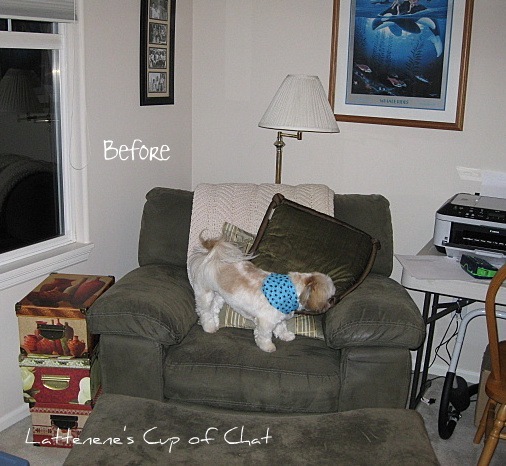 Here’s my previous post on the the chair makeover. 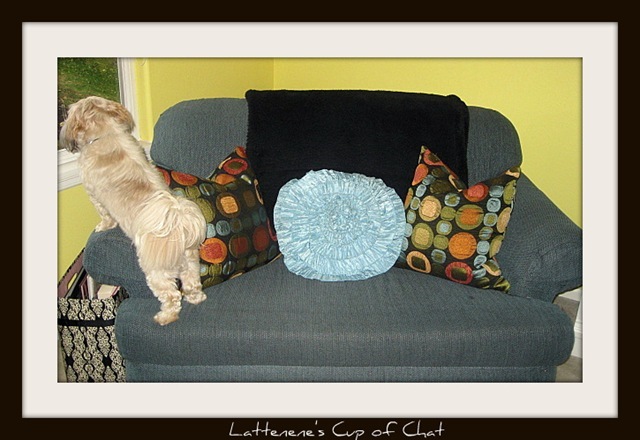 I am still looking for a plain black chair cushion. A friend gave me the had a green polka dot shade which I spray painted. 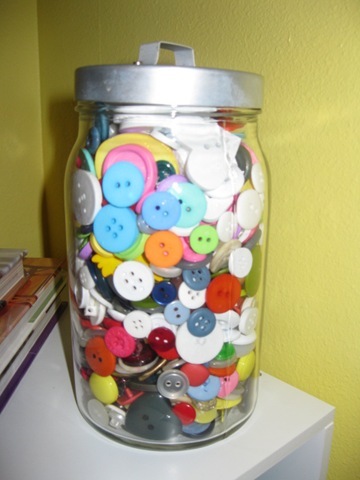 Da ua love my jar of buttons. I do!! The jar came filled with peanut brittle and was a Christmas gift from a friend. 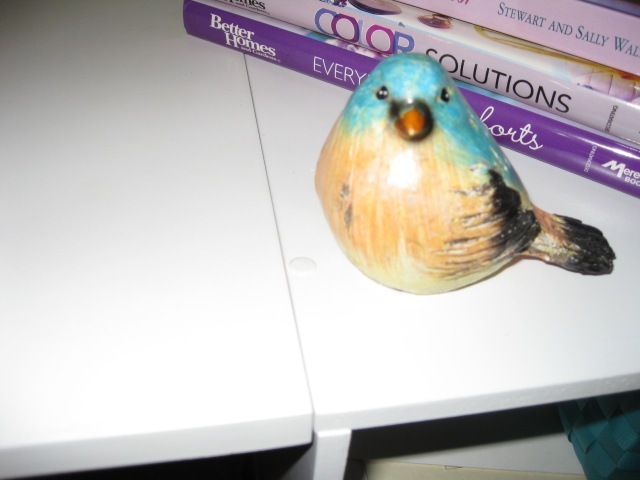 The little wood carved bird came from ACE for $1.50. 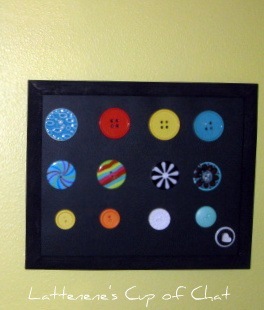 My button wall art inspiration Pinterest. 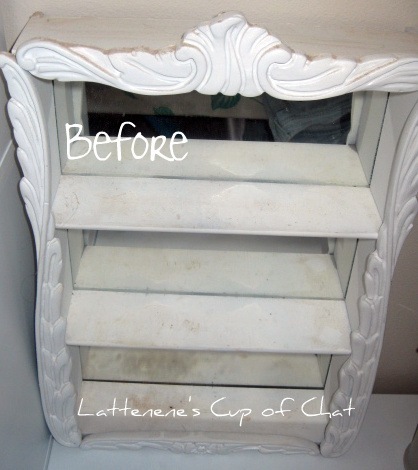 I repainted a mirror I already had, see here. The 3 frames came from the dollar store. I framed scrapbook paper. fill. The picture above the cubes is from TJ Max. An old round black garbage container is holding all my cellophane wrap I use to make candy bouquets. 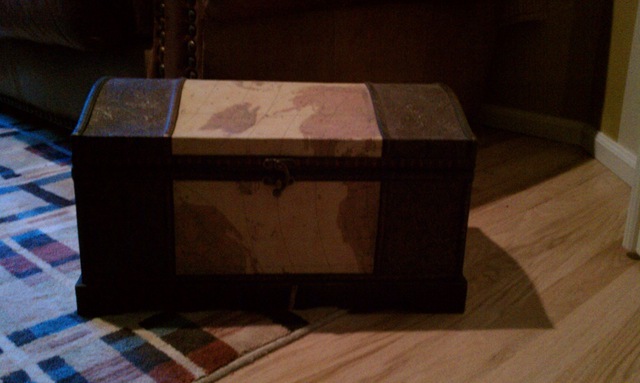 I also gave the dresser pulls a coat of Rust Olem Black Hammered spray. I apologize for the glare on these pictures. 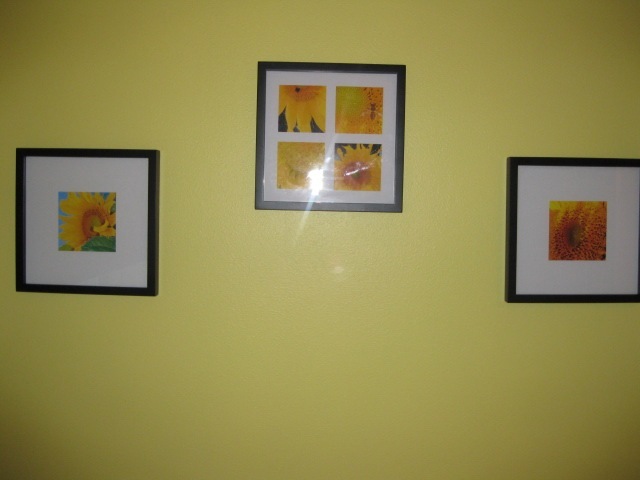 My friend took these fabulous pictures of sunflowers and used my home printer to make copies. I’ve had the frames stored in the closet for at least 10 years. No laughing! Total cost at the end of the day including paint cost was approximately $140.00. I’ll break it down in another post. I feel pretty good at meeting my minimal cost rule. Future purchases incluse a better mattress and bedding for the fold out bed. Over all I’m happy with it. My hubby told me it was definitely a female room so I know I succeeded in what I started out to do. Please let me know what you think. Happy Friday everyone!! Yay! I do love the weekends. I’m still working on the spare room, aka craft/guest/reading/my room. Hopefully it will be done by the time I go back to work on Monday. After all, it’s Fall and that means let the decorating and yard cleanup begin. I finished another project and did not spend any additional dollars to complete as I had everything on hand. 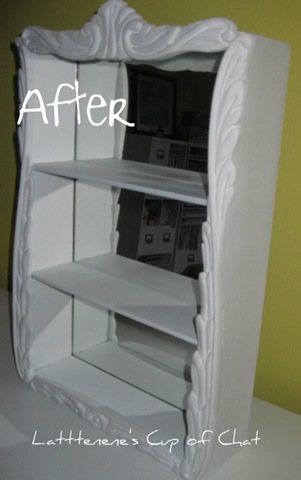 I had an old, dirty, but cute shelf sitting in the corner of the garage just waiting to be painted. Once again, Rust Oleum to the rescue. 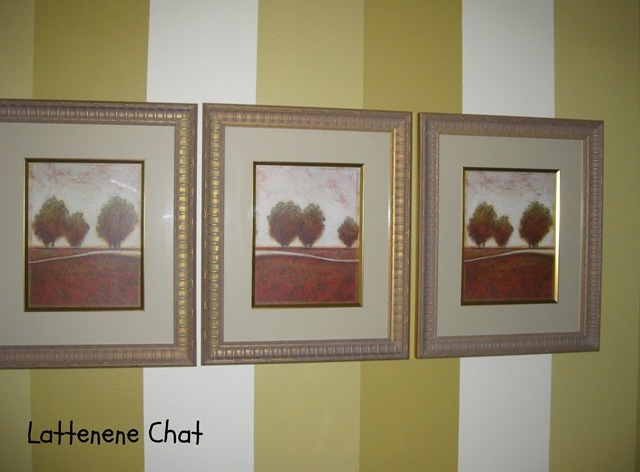 It was a simple fix and it will look great on one of the smaller corner walls. And how my goodness, the white will pop so well against the yellow walls. 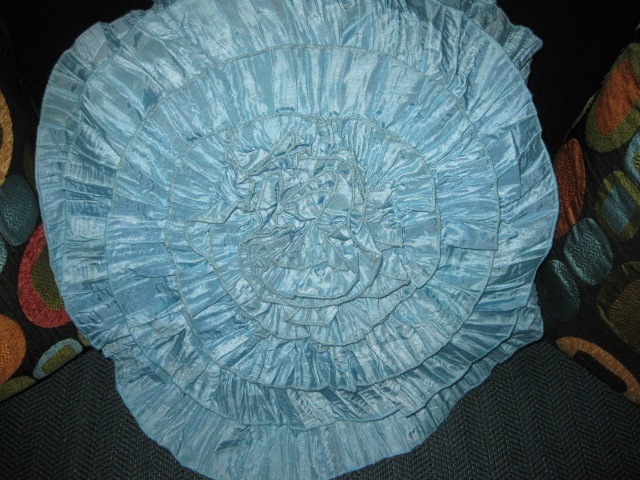 Here are a couple of pics, not the best, but wanted you to have a closer peek at some of the scrolled edges. I think its so pretty. I also am still contemplating what to do with the white dresser. It’s not solid wood and I used it in my son’s nursery and he’s 20 now. 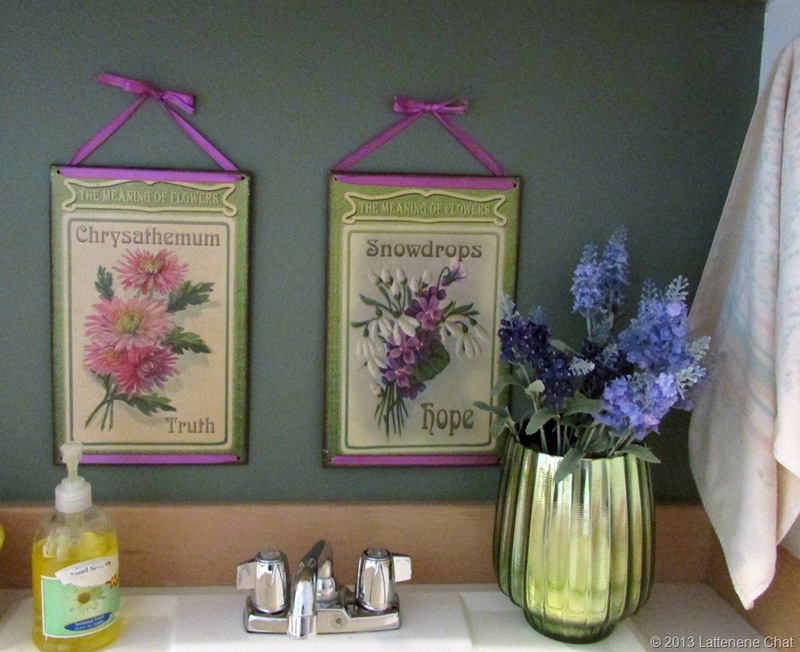 I’ve thought about painting, stenciling, using rub-ons, contact paper or wall art stickers. It’s not in to bad of shape so I may keep as is until I can 100% decide in my head what I want to do. 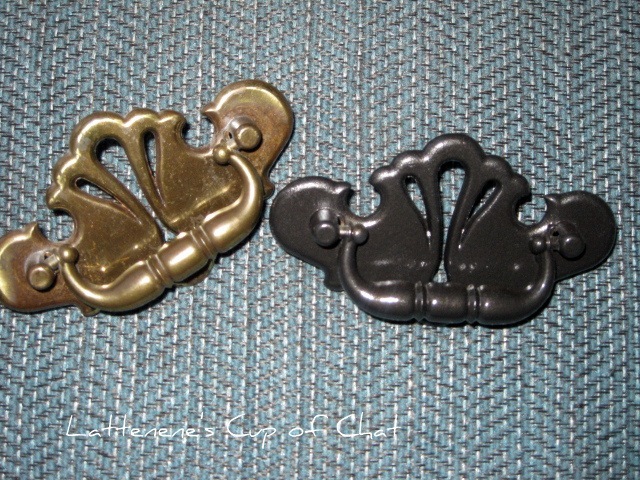 In the interim I’ve spray painted the drawer pulls to a metal black. Much better, don’t ya think? Lastly, made a quick stop at TJ Max yesterday on the way home from work. By the way, L.O.V.E. that store. Spent very little money for 3 pillows, and a throw blanket. I think there all pretty special and compliment the loveseat and walls. Big heart for the pillow in the middle. 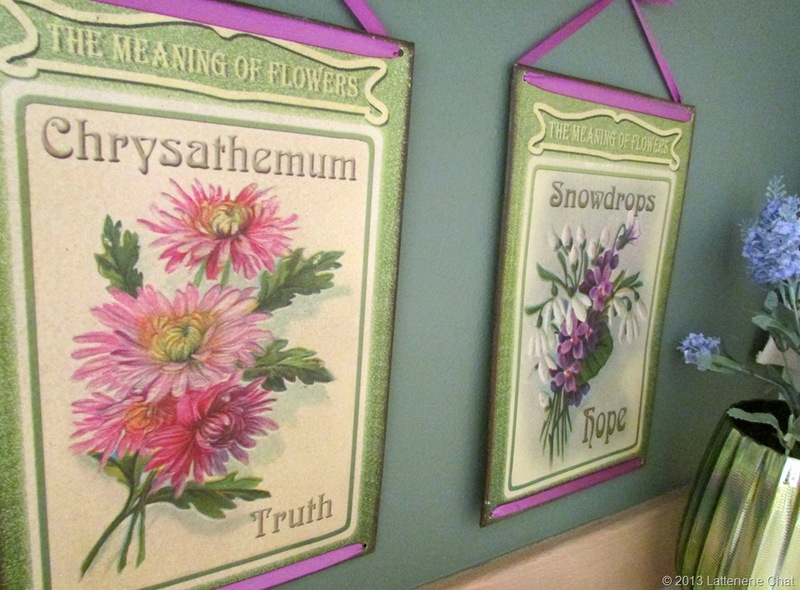 Every room needs something really girly. One more thing about the pic above. I used one of the features in piknick to get the white matte/black frame look. I’m going to print out and if it looks good I won’t have to by mattes for the picture frames! I also picked up a couple of more items while I was at TJ Max. They fall into the “just have to have because” category. I know I said I wasn’t going to buy any items for the walls. 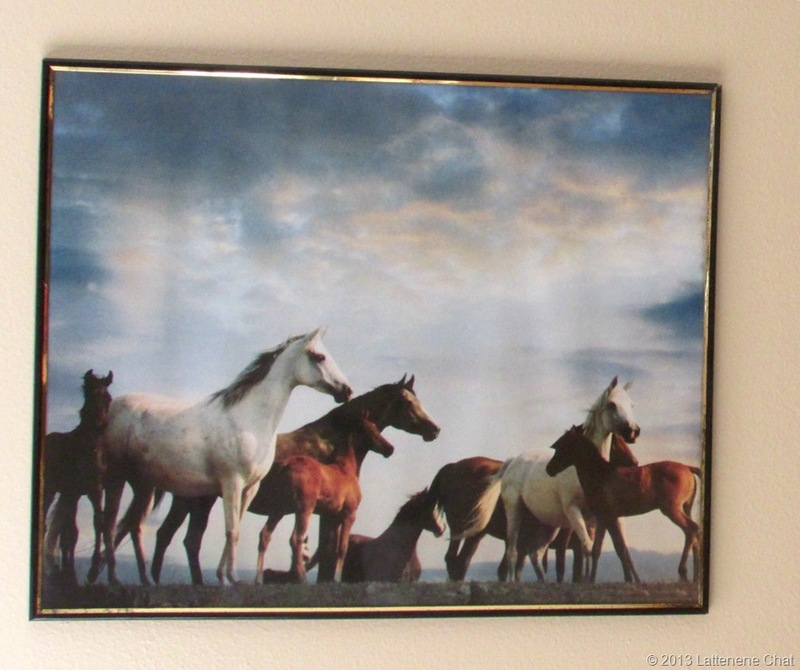 My goal was and stii is to use what I already have and/or create art for the walls but…..this picture was only $12.00 and I think it will be perfect. I mentioned an additional 2 purchased items, didn’t I? Here’s the really big splurge. 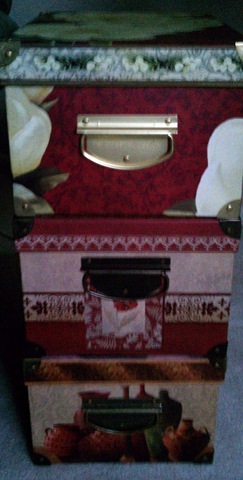 Fell in love with it and hey, the lid comes off so I can store stuff! Hey, I think it’s your first glimpse at the yellow walls. Pretty bright! It makes me feel like sunshine. So what do you think? Mornin! I’m almost done completing my Spare Room Project, aka craft/guest/reading/my hangout. I have one blank wall that I would really like to make pop with pictures that are meaningful to me (family, places I’ve been, special moments in time, things I love) and maybe a few created art projects created by me. I actually shared some ideas in a previous post earlier this week. Love the black and white against the bold color and especially the outline of black. OMG, do I need to do some additional painting? 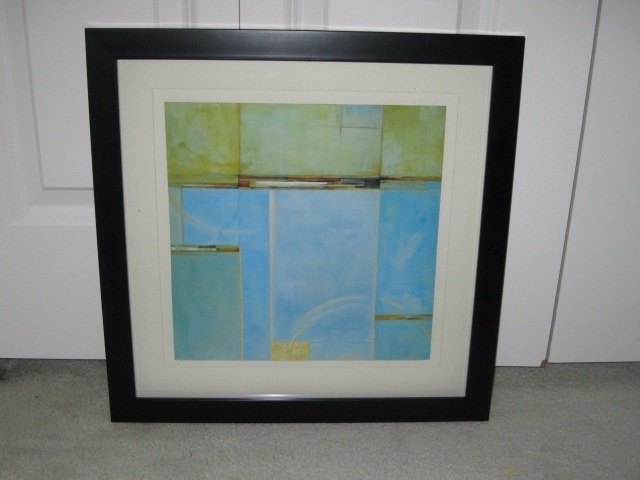 frames are different sizes, widths, colors, but it all blends nicely, doesn’t;t it? Pops of bright color = the matting is outstanding! Hmmmm, me likey. 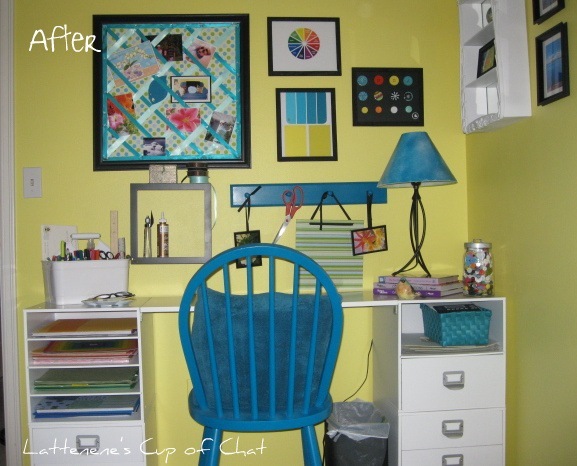 My yellow walls, my colors (yellow, turquoise, black, white), different shapes, a little bit random, just like me! A mix of color, shapes, sizes but still goes together. This could be the ticket! But then again maybe not. I think I need to do a layout on the floor before I start putting nails into my new beautiful yellow walls. Stay tuned!